Mrs Peel drops by to see Steed and finds him apparently unconscious on his Knole sofa. A man in a trench coat enters cautiously and taps her on the shoulder - she whirls round and attacks him, easily getting the upper hand. Steed "wakes" and tells the man, Major Carson (Eric Lander), he's proved Mrs Peel can do the job. "What job?" she growls, and is told Steed represents Security at an upcoming conference. The department has learned that the mysterious Colonel Psev's entourage has arrived in the country and been identified but no British agent has ever seen Psev. She's shown photos of the entourage - Elena (Maria Machado), Vogel (Julian Glover), Shvedloff (Alec Mango) and Pudeshkin (Wolfe Morris) - and told Psev likes Crème de Violettes, Jamaican torpedo Nº3 cigars, smart suits and model planes. She's set to work in a model shop and is visited by an embassy underling called Sergei Ivenko (John Bluthal), who wants to buy a Lancaster bomber model "with all the accessories". At the Embassy, Brodny tries to deliver the model to Psev personally but Psev's staff intervene and he's sent away to get Psev's cigars and liqueur. Steed finds Brodny in a bar, desperately searching for the elusive Crème de Violettes. He teases him with hints of returning to the Motherland before giving him a bottle of the liqueur - and tricks him into revealing that Colonel Psev is at the Embassy. 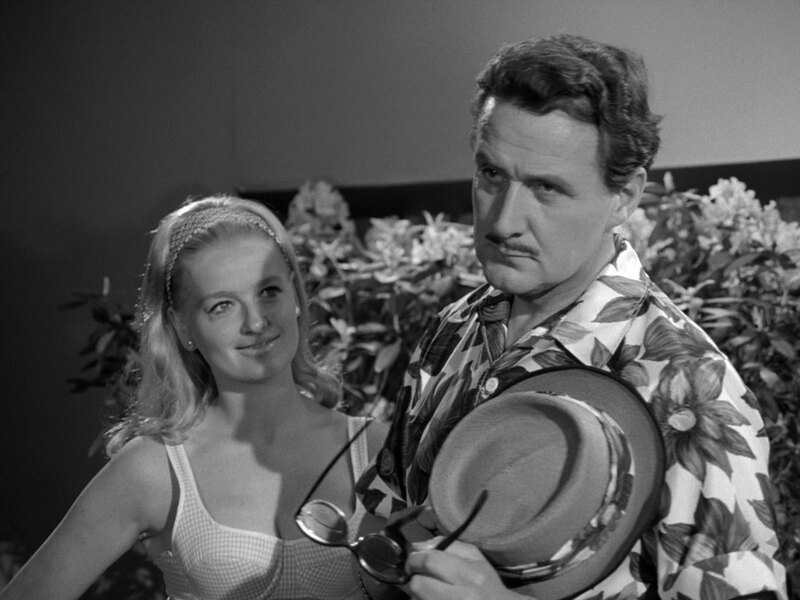 Brodny rushes back to the Embassy, where he is brushed off and sent to a fashion show with Ivenko. 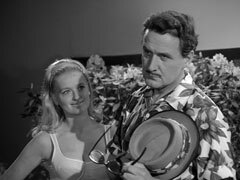 Ivenko nudges a slumbering Brodny awake and Brodny is astonished to see the sleazy model on stage, Gordon Webster, is a dead-ringer for Steed. Brodny rushes to the 'phone and calls Steed, he smiles when he hears Steed answer the phone, then hangs up. Brodny reports back to Psev's entourage - Webster is an opportunist and highly corruptible and can help them infiltrate the conference. Vogel tells him the plan is excellent - he is to remove the agent watching Steed's apartment and place a bugged umbrella in Steed's apartment. Brodny switches the umbrella for Steed's when he delivers a thank you gift of brandy. When he returns, Vogel orders the television be turned on and they watch Steed greet some defence leaders at the conference - and Webster saunters in. 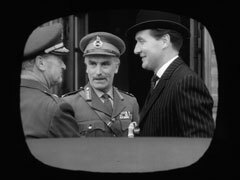 The spies are pleased with his resemblance to Steed and ply him with drink and cigars, Pudeshkin inadvertently letting Psev's name slip. Webster says he's in over his head, especially when Vogel reveals he knows his history. Ivenko breaks one of the model planes when he lights Webster's cigar and is sent from the room in disgrace - at the door he overhears Shvedloff suggesting he be sent home. Ivenko orders a new model and Mrs Peel offers to deliver the replacement herself. Meanwhile, Webster agrees to eliminate and impersonate Steed, for a very hefty fee and is pleased to discover Mrs Peel is a close friend of his target. Steed's 'phone rings and the spies and Webster hear him reporting to Security. Webster makes a reasonable impersonation, slipping backing into his own voice occasionally, but Elena is impressed. Mrs Peel delivers the model but insists on £2 before handing it over - she takes the opportunity to look around and sees Webster through a doorway. She visits Steed, who declares he hasn't been near the embassy. She insists he most have a twin, who Psev may be using, but Steed brushes it off - Carson will protect him and she'll spot a fake a mile away. Back at the embassy, Brodny has Webster attired like Steed but is less convinced as to his elan than the others. Vogel proposes an acid test - he will stand in for Steed at a cocktail party and if Mrs Peel accepts him, he's in. 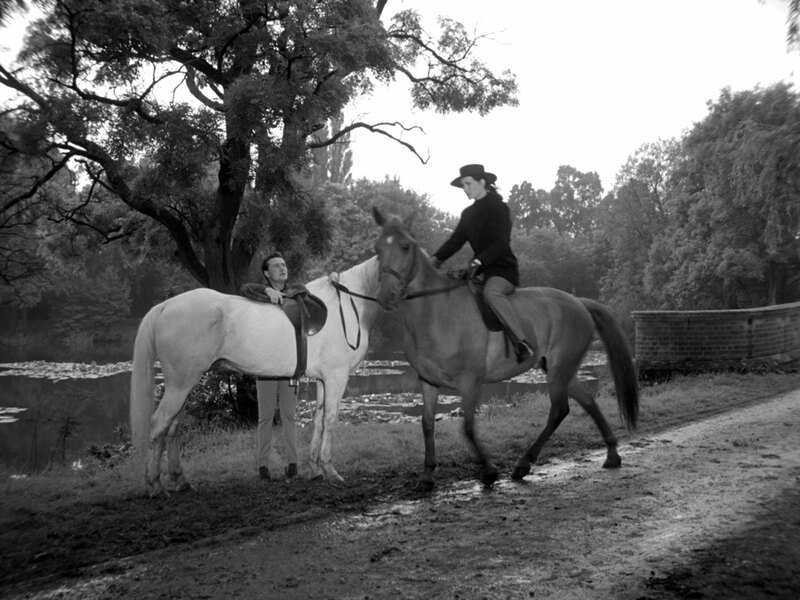 If she "rumbles there's more than one Steed"... "there will be one less Mrs Peel..."
Next day, Elena calls Steed, using a codeword to get him to report to HQ. Carson stays behind and Steed drops Mrs Peel off at the embassy for the cocktail party. Brodny is dismayed when they arrive together, but Steed drives off and she enters the party alone. She greets Brodny inside then mingles with the other guests while he hurries off to make sure Webster is ready. 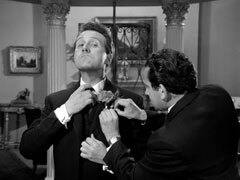 Ivenko pins a massive foiled carnation with leaves to his lapel and Brodny is shocked when he sees Webster wearing it while chatting to Mrs Peel. He whisks Webster away and Elena strips the buttonhole back to just the flower. Webster asks who "Fido" is - Mrs Peel just asked him - and Brodny tells him it's a vintage car. He returns and Mrs Peel is polite but senses there's something wrong; she goes to ring Steed's apartment, but the line cuts out when she calls. Webster enters behind her and pulls the pistol he's been given; he explains to the spies that she spotted him. Vogel advocates keeping her hostage instead of killing her. Later, Brodny gives a dismayed Ivenko his ticket home and kisses him goodbye. Ivenko checks Brodny's desk and finds his file marked "FOR ELIMINATION". He rings Steed and asks for protection - he can tell him who Psev is. They agree to meet at the lake in the embassy grounds - but he has been overheard, Vogel steps from behind a curtain then watches him through the window with binoculars. Vogel then operates a remote controlled submarine model, which surfaces and shoots Ivenko before he can reach Steed. Mrs Peel is dragged into the control room and the guards leave. She's surprised when Steed climbs in the window and asks her if she's alright. She tells him about the double as he searches for a knife to cut her bonds. 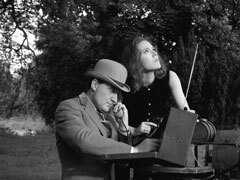 He asks her how she spotted the fake then some of the spies enter - they are pleased she thought Webster was Steed in this second rehearsal. Webster is shown a map of London marking his route and given the key to Steed's apartment and a gun. Brodny doesn't trust Webster and says he should be accompanied - then realises he will have to do it himself. Webster gloats over Mrs Peel, knowing he fooled her and has a celebratory drink, smashing the glass in the fireplace next to her, Russian style. Brodny calls when they reach Steed's apartment and they tune in to the bug - they hear Carson shout in surprise, then two gunshots. Webster arrives at the conference, seen on Vogel's live TV coverage, just as Mrs Peel retrieves the broken glass from the fireplace; she starts to cut her bonds as Webster is granted entry. An hour later, Webster emerges at the end of the conference - the plan has worked. Webster returns with Brodny and Vogel lets him - but not Brodny - in to see them. 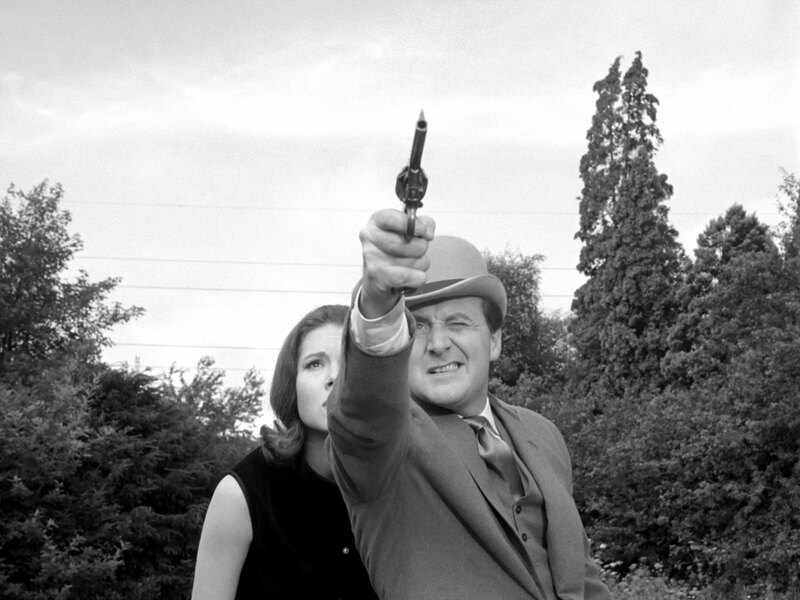 Mrs Peel, now free, snatches a gun from a guard and hold them all at gunpoint, demanding they hand over the camera. Webster wrestles the gun from her grasp and she surrenders the tie pin camera to Vogel. Vogel gasps - there's no film. Webster says he will only hand the film to Psev, and directs them to the inner sanctum with the revolver. There's no-one inside and Vogel proudly tells him they are all Psev - the name comes from their initials - Pudeshkin-Shvedloff-Elena-Vogel. Webster hands over the film then quietly backs out of the room with Mrs Peel. 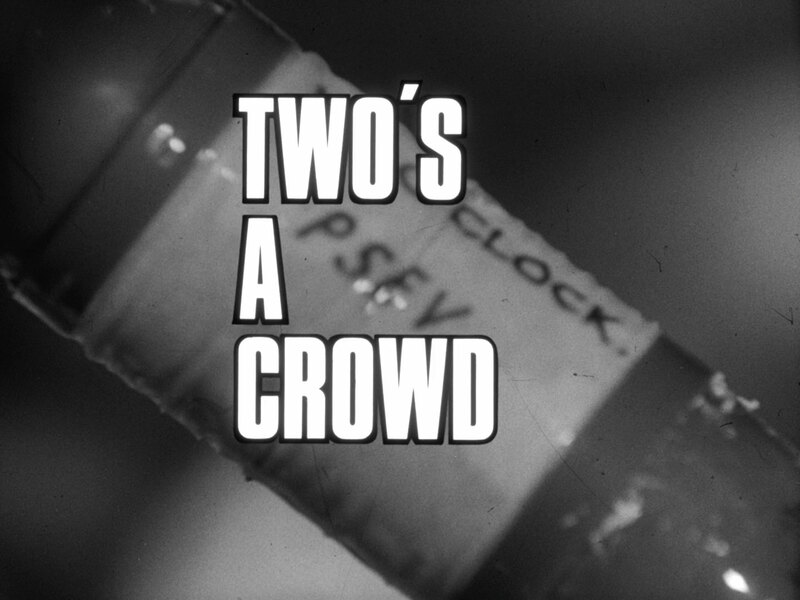 The first picture is not of the conference at all, Steed has tricked them and it simple reads "TWO'S A CROWD!". They run out into the grounds of the embassy and he's surprised when Mrs Peel hits him - she still thinks he's a fake. He proves he's really Steed - he and Carson guessed who Psev was from their initials and set out to prove it; in fact Webster never existed and even the conference was faked. Steed shoots down the model aeroplane that has been sent to attack them but a bomber is then launched. Steed opens the case he's been carrying - it's a short wave radio. He tries to reach the Major but Carson's frequency is the same as that of the bomber, which he sends back at Psev and the bomb falls on the embassy. 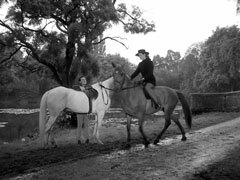 Steed is riding in the embassy grounds when he meets Mrs Peel, also on horseback. He greets her but she hautily replies, "I'm afraid you're making a mistake, my name isn't Peel. So sorry. ", then rides off. A short distance away she stops and calls to him, he canters over and they ride off together.